I love my pin looms and I have a BIG collection of them. I am convinced that I need to have at least two of every size loom that I commonly use. I have a bunch of 4" x 4" looms and will often wind three or four at a time before weaving. 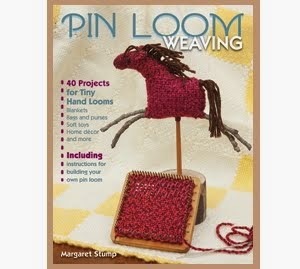 I use looms made by all the current and past pin loom makers and I love them. I am mentioning all this in order to demonstrate that I am a really big fan of good, well made looms. You can get a perspective on good pin looms here. But in the midst of my loom fandom, it is easy for me to forget that any loom you can weave on will work. In other words, let's not forget that a cobbled together pin loom can be just as rewarding, weaving-wise, as something much shinier. sharing it with everyone because it looks awful. And if we want an example of a non-shiny loom, this one will definitely take the prize. I recently decided that I needed a 3" (7.6 cm) x 3" loom. I only needed it for one project, so it probably would only be used a few times and I wanted it now. So I pulled out my 4" (10.2 cm) x 4" Loomette Loom and copied off the pin placement on to a 3½" (8.9 cm) x 4½" (11.4 cm) piece of half inch (1.3 cm ) plywood, removing an inch from each side of the layout since I wanted this loom to be 3" (7.6 cm) x 3". I used 1¼" (3.2 cm) wire brads for the pins, pounding one in at each marking. Here's how it looks. I did a terrible job, at least half the pins are bent and that doesn't include the dozen or so brads that were so badly bent over that I had to pull them out and try again. (I didn't take a picture of the reject brads, it was too humiliating.) And yet the loom still worked reasonably well. Since I followed the pin placement on the Loomette, which weaves up exactly the same as the Zoom Loom and Weave-it, I could be sure that it would match the sett on the other pieces I was weaving. Because the Loomette has equal spacing between its pins, it offers a little bit more space for the weaving needle. Completed square on a very poorly made loom. The next two pictures show the finished 3" square on and off the loom. You can see that one side is pulled out by the poorly placed pins. However, it didn't make any difference in the completed item because none of the edges will show. So in return for a very small financial investment, a little time, one hammer blow to a finger and the continued embarrassment of sharing this ugly loom with you, I have a brand new, workable loom. It was totally worth it. A few more words about the loom. You may notice that it has a rounded out opening in it. This loom was small enough that I could have woven with it without that opening but it is always easier to weave if you are able to get at the yarn from the underside. At my request, my husband drilled four 1" holes in the wood. I took a coping saw and sawed between the holes to open it up. I sanded all the surfaces so that it was comfortable to work with. You may also notice that the shape of the wood base does not match the pin pattern. This is because I found the wood in the scrap pile and just started pounding away on it. It turns out that having an even edge around the pins is another of those attractive features that is not entirely necessary. Another important word about this loom. This is not the method for building a pin loom that is detailed in the Pin Loom Weaving book. 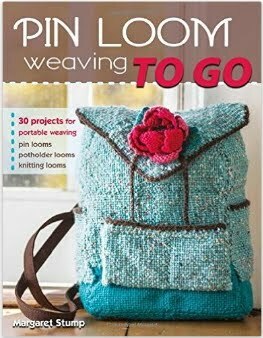 If you follow the directions in the book, you will get a reasonably attractive and very usable loom. The point of this article is that there are a lot of ways to make a pin loom and if you are able to weave the piece of cloth as you intended, you have been successful. I have a feeling that there are many people who would disagree, feeling that the quality of the tools is as important as the product. And I agree with them most of the time. A great loom should support great weaving. I just don't want the need for a great loom to impede weaving. The perfect way to end this post would be to be able to show some of the exquisite looms made by hand that people are weaving on. I don't have any pictures of those excellent looms, but I know they are out there. My woodworking skills, as seen above, encourage me to rely on my husband and other good loom makers.